Using an exercise ball during pregnancy has many benefits. I was wondering myself how I would continue doing Pilates during pregnancy as the positions on my back and stomach would not be possible later. Having done Pilates exercise ball classes for years and making a Pilates core ball DVD based on these, I picked out the exercises I felt would be most beneficial for pregnant exercising. 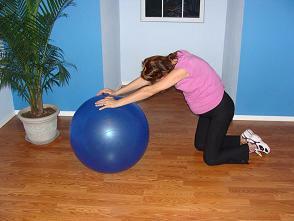 Below are some of the exercises I have found to be most helpful for me to do on the exercise ball during pregnancy. I have found that a gentle modified spine twist on the exercise ball during pregnancy helps to stretch and strengthen the muscles at the waist and middle part of the back. Sitting tall on the exercise ball and keeping the nose, breastbone, and navel in one line turn from the waist with an inhale, then exhale to come back to start. Turn 3-6 times on each side rotating more each turn. The Pilates Mermaid or Side Stretch over the ball is another feel good stretch for me as it helps with the mid back pain I was feeling during pregnancy due to postural changes. 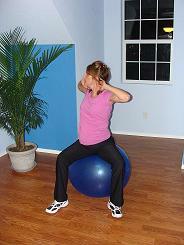 This great oblique exercise helps to open the ribs and strengthen the oblique muscles on the sides of the torso. Press through your feet to support you as you stretch the spine to the side with an inhale, exhale to return to the start. Repeat for 4-6 times. This combo stretch was most helpful to me while doing the exercise ball and pregnancy because it was helpful at stretching my low back. This exercise really helped me to relieve the pain in mid and lower back after working all day. With the change in my posture due to being pregnant it was very uncomfortable to drive, and after standing and moving all day doing Pilates work I used these stretches when I'd get home at night. Use the ball to flex or round your back with an exhale, then inhale as you push the ball away extending your spine and poking your tail out. See the cat stretch without the exercise ball here. Pilates and pregnancy exercises work well when you do these basics to keep your abdominal and pelvic floor muscles strong helping you to prepare for labor and delivery. Work on rolling or articulating the spine with these exercises that help to stretch the spine while strengthening the abdominal and deep pelvic floor muscles. Exhale as you tilt or bridge up and then inhale to stay at the top with your hips lifted. Then exhale to roll the spine and hips back down to start. Repeat for 6-10 repetitions or until you have loosened your spine. Check out my DVD for more exercises to do on your exercise ball during pregnancy and then some more challenging to get your body back after pregnancy. Find out more ways Pilates exercises can help you live better and enjoy life.